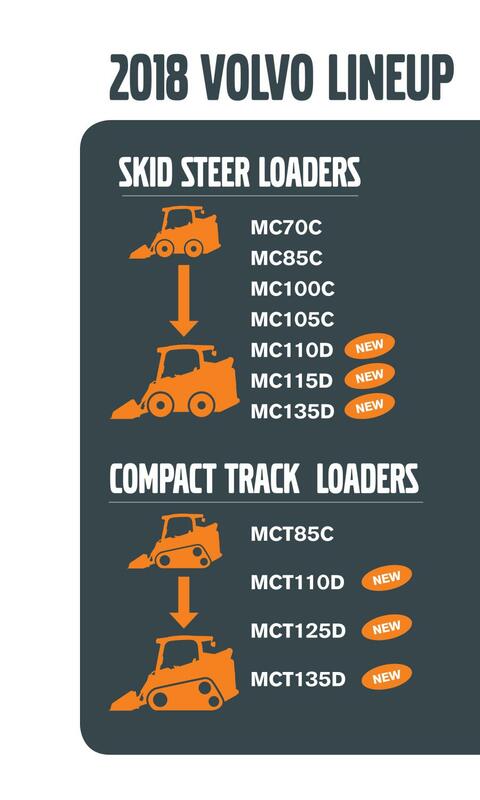 The new MC110D, MC115D and MC135D skid steer loaders, and MCT110D, MCT125D and MCT135D compact track loaders offer more strength, greater capacities, and improved safety and operator comfort. Volvo D-Series skid steer loaders and compact track loaders have been revamped with a stronger boom design, backed by Volvo's lifetime guarantee, that provides up to 11 percent higher lifting capacities versus the prior generation. Together with cabs that offer 30 percent more room and up to 60 percent greater visibility, these differentiators result in measurable advantages, according to the manufacturer. “From the improved boom design to the larger platform, entrance and cab — the D-Series is the culmination of customer feedback, significant research and development, and a great deal of field testing. The end result is an impressive lineup that is among the most productive, durable and safe in the industry,” said Kevin Scotese, product manager, Volvo Construction Equipment. The D-Series is equipped with the next-generation curved single loader arm, built with 20 percent more steel than conventional models. The heavy-duty design and extra reinforcement provide more strength and rigidity while efficiently distributing the load, which reduces material loss from the bucket and limits sway in heavy pallet handling applications. Several of the D-Series models also come with significant rated operating capacity (ROC) improvements over their preceding models. The MC110D has an ROC of 2,500 lbs., up from 2,250 on the C-Series (+11 percent). The MC115D has an ROC of 2,700 lbs., up from 2,600 lbs. on the C-Series (+4 percent). The MCT110D has an ROC of 2,500 lbs., up from 2,250 lbs. (+11 percent), and the MCT125D has an ROC of 2,700 lbs., up from 2,600 lbs. (+4 percent). An optional counterweight kit can take the MCT135D from a 3,000- to a 3,200-lb. ROC (+7 percent). The D-Series machines are equipped with a fully enclosed attachment bracket that eliminates the need for greasing, as well as a replaceable, reversible wear plate. The new visual indicator lets the operator know when the attachment is locked. 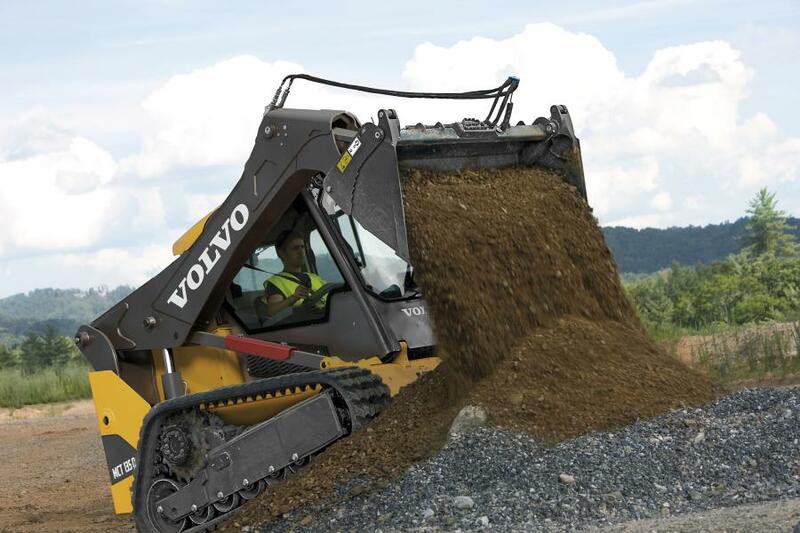 The ROPS/FOPS high-spec Volvo cab is the largest on the market, offering more than 30 percent more room than standard skid steers and compact track loaders. The wider side-entry door and new handrails allow operators to enter more safely without stepping over an attachment, and less effort is required to close the cab door due to a new cab air vent. With the curved single loader arm, large top window and narrow ROPS cab pillars, operators benefit from 270 degrees of visibility — up to 60 percent more than conventional models featuring the two-arm design. The arm and attachment bracket are better than ever, offering superb forward and side views of the attachment and job site, according to the manufacturer. The redesigned D-Series also features large glass panels and a rear-view mirror. Fitted with an adjustable seat, the noise-insulated cab provides generous legroom and storage, an advanced climate-control system and easy-to-read gauges located in the two ergonomic consoles. Access to internal components is made easier with the D-Series due to the forward-tilting cab, a process that can be performed by one person without the need to raise the arm. For added convenience, all service and maintenance points are arranged in a simple layout, which also can be accessed using the large rear door. Customers also can benefit from a range of services and support programs, such as the Volvo Lifetime Frame and Structure Warranty, which covers the loader boom and arm for the life of the equipment under the initial owner. For more information, call 717/532-9181 or visit www.volvoce/com/na.